I hate (strong word, I know) the feeling that sneaks up on me on the last day of vacation. I mean, everything is going great, and then BAM! It hits me. Back to reality. I’m going to have to start making my bed again. Geez. Unfortunately, lunch didn’t pan out as planned. (Seems to be a reoccurring theme for this vacation, doesn’t it?) We were hoping to stop in at The Chicago Diner, which just happens to be on the list of the top 21 vegan restaurants in the United States. But, as luck would have it, traffic was not horrendous in Chicago, and we made it all the way through by 11:00. I was definitely not hungry. Plus, in all honesty, we had eaten there last summer, and while it was good, it was not mind blowing good. Maybe it’s just what I ordered. I don’t know. Someday I will have to reevaluate. But not today. Anyway, I did have a backup plan. Yep, you knew it. Whole Foods in Milwaukee, here we come! I love their hot/cold food bar. Have I mentioned that before? Plus, I was able to get some of the grocery shopping out of the way. You just can’t beat their fresh produce! I feasted on kale, marinated mushrooms, curry cauliflower, veggie tabbouleh, wheat berry salad, and a couple of pieces of tofu. And for dessert? 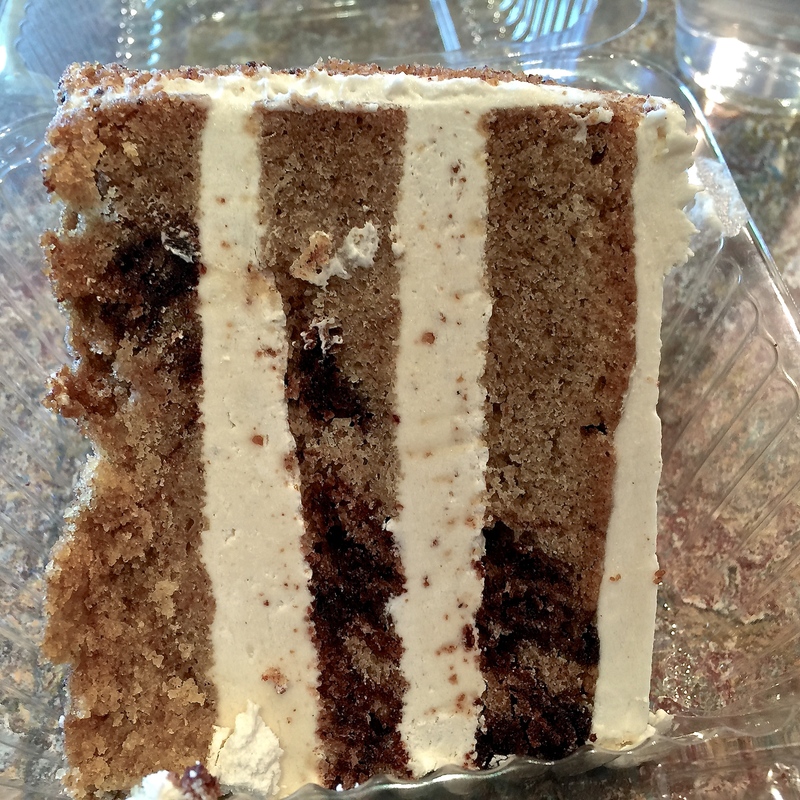 …my favorite cake EVER, which, BTW, just happens to be from The Chicago Diner! Cookies and Cream Cake! Should I ever end up on death row, this will be my last meal. 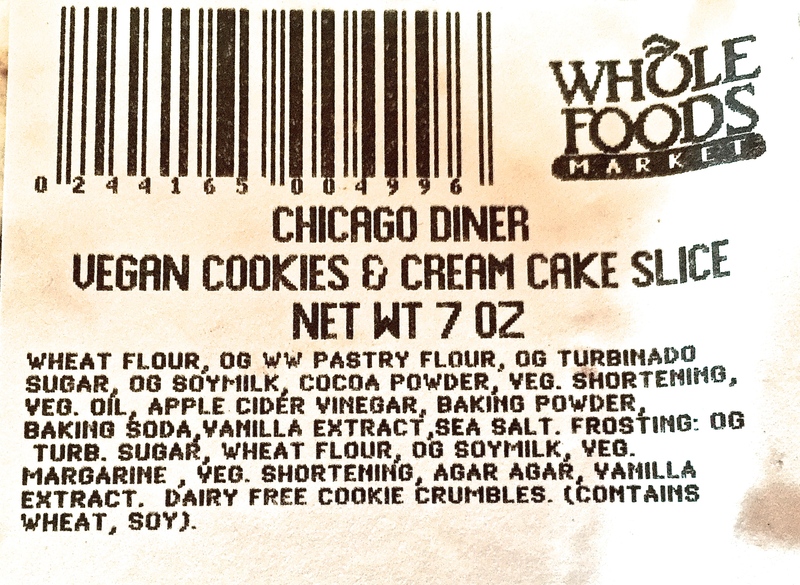 The ingredient list is a little bit scary for me, (you know I’m not a fan of processed foods), but this is a special treat, not a weekly occurrence. Or at least that’s what I always tell myself, as I’m ripping open the container. I managed to polish off half before closing the lid and calling it a day. And if I’m feeling extra adventuresome, I’ll be attempting that hemp milk latte with turmeric.